Phone: (647) 527-1187 | (902) 838-3959 · Email: reservations@maplehurstproperties.com · Book Online! We apologize that the B&B (Manor) will not be available during the 2019 season as we are undergoing some renovations. 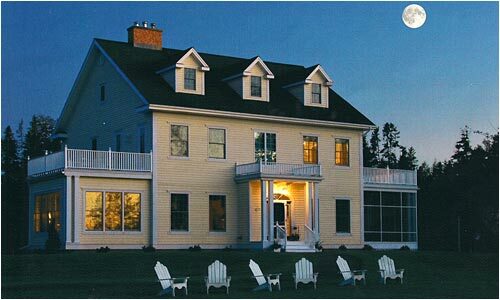 The manor (duly named Maplehurst for the native maple trees scattered throughout the estate) operates as a bed & breakfast for guests so that they may experience the same serenity, breathtaking sunsets, and scenic beauty of Atlantic Canada's island jewel. 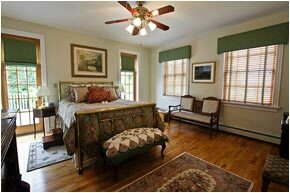 It features four individually appointed, luxury guest rooms with private baths designed to appreciate the traditions of the past with modern conveniences. 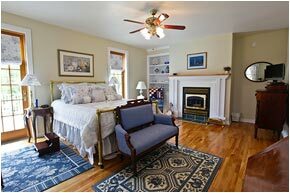 Furnishings include fine artwork, unique period antiques, guest amenities, with attention to detail and your comfort. Guests may experience an unforgettable family holiday or weekend getaway. 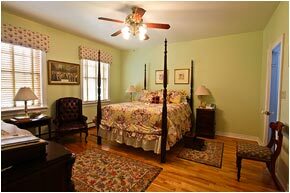 Each guest room, with exception of the George & Elizabeth Suite, contains a queen-sized bed with designer linens, fine antiques, and private en-suite bath. In addition, we provide his and her terrycloth bathrobes with slippers, steam iron and ironing board, AM/FM alarm clock radios, wireless high speed internet, DVD, telephone and compact disc player. 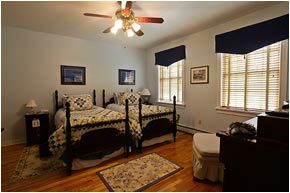 In the bath, we provided guests with ample amenities (e.g., hairdryers, bathing salts, body lotion, facial soap, etc.) intended to make your stay more comfortable. Named for England's longest reining monarch, no detail has been overlooked in the manor's finest suite. 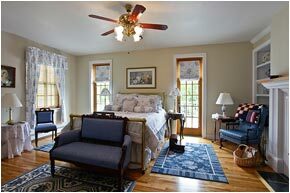 Guests will sleep peacefully on a circa 1850 brass queen-sized bed, which was once reserved for the visiting bishop at Eastern King's County St. George's parish. 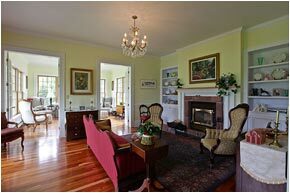 The suite, furnished with island artwork and a portrait of Queen Victoria, contains a private wood-burning fireplace as well as a Victorian settee set, satellite television, DVD, and telephone In addition, guests may access their private verandah to enjoy the spectacular views of Cardigan Bay. The adjoining bath contains a whirlpool bath and shower. In honor of England's queen for which the Island's capital city was named, guests will marvel at the breathtaking views of Cardigan Bay from their suite and private verandah. As with all guest rooms, the suite is furnished with unique antiques and includes an 18th century vanity with mirror and a circa 1850 brass queen-sized bed from St. George's parish, satellite television, DVD, and telephone The adjoining bath contains a whirlpool bath and standing shower as well. The soothing blue walls and fabrics complement the serene woodland view from this suite, which is ideal for children or traveling friends. The suite features a pair of French-polished mahogany four-poster single beds tastefully furnished in a French-country style and a Victorian chaise lounge, satellite television, DVD, and telephone The suite contains a private en-suite bathroom with shower and bathing tub as well as an ample walk-in closet. Named for Edward VI and his wife featured in the nineteenth century coronation painting adorning its walls, this distinguished suite with woodland view has bright and brilliant yellow and green floral motifs. Guests will marvel at the beautifully carved mahogany tables, dresser and mirror featuring the Prince of Wales plume while relaxing on the elegant four-poster queen-sized bed. As with the George and Elizabeth Suite, the suite contains a private en-suite bathroom with shower and bathing tub, satellite television, DVD, and telephone. 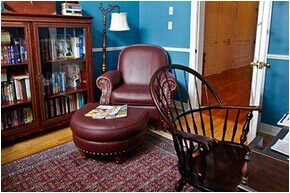 Both woodland view suites are adjacent to the manor's inviting library, which is open to all guests. Ideal for an afternoon or evening escape, the library has bright picture windows and a plush leather sofa and chair for ultimate relaxation. Read your favourite novel, choose one of your favourites, or pen your own at our antique spinet desk. If you should choose more modern pleasantries, the library contains wireless highspeed internet access for laptop computers. Furnished with fine period English and Island antiques, guests will find ultimate relaxation throughout the manor's common rooms, which are open to all guests. 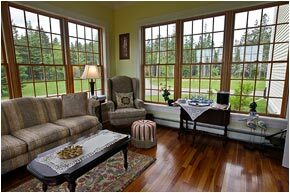 In our Sunroom, guests will enjoy our spectacular view of Cardigan Bay or select your favourite movie from our video library to watch on our downstairs television and VCR/DVD. 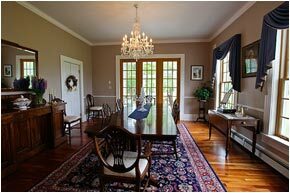 Guests will savor our delicious hot breakfast served in our Dining Room. Please inform us at time of reservation and we will make every attempt to accommodate special dietary needs. If you should require an early check-out prior to breakfast, we will gladly prepare traveling breakfast meals for you. 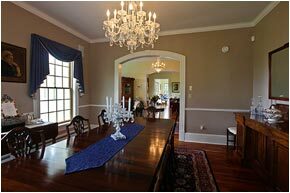 Complimentary sodas, cookies, and cakes available in butler's pantry off the Dining Room between 11am and 10 pm.